Tidore is an island located in the Maluku archipelago. Before Islam came to earth archipelago, known by the name of Kie Tidore Duko, which means the island is volcanic. The naming is in accordance with topography Tidore which has a volcano - even the highest in the Maluku islands - which they named the mountain Marijang. Currently, the mountain Marijang no longer active. Tidore name comes from the combination of the two series and Tidore word dialect of Iraqi Arabic: the language of Tidore, To re ado, meaning, 'I have arrived' and the Iraqi dialect of Arabic anta thadore which means 'you came'. Merging two sets of words from two languages ​​stems from an incident that occurred in Tidore. According to his story, in this Tidore frequent clashes between the Momole (chieftain), which is supported by the members of each community in the fight over tribal territory. The dispute is often caused bloodshed. Attempts to resolve these disputes is always a failure. One time, an estimated 846 years AD, Ibn Chardazabah entourage, envoy of the Caliph al-Mutawakkil the Abbasid Empire in Baghdad arrived in Tidore. At that time, in Tidore was going dispute between momole. To mitigate and resolve these disputes, one party member Ibn Chardazabah, named Jacob Syech intervene by facilitating the negotiations referred to Togorebo. The meeting agreed on a large rock at the foot of the mountain Marijang. The deal, momole who arrived most quickly to the location of the meeting will be winners and chaired the meeting. In that event, every momole are up to the meeting location is always shouting To re ado, because he felt it was he who came first and be a winner. However, apparently some people are fighting momole arrived at the same time, so nothing is lost and won. Intermittent few moments later, Syech Jacob who became facilitators also arrived on the scene and said the dialect Iraknya: Anta thadore. Because the momole came at the same time, then nothing is a winner, finally appointed as the leader is Syech Jacob. That said, since then has become a popular word Tidore, a combination of two words: Ta and Thadore re ado. Thus, said Tidore eventually replaces Kie said Duko and became the name of a great empire. According to the Sultanate of Tidore, the kingdom was established Jou Kolano Sahjati ascended the throne on 12 Rabiul Awal 502 AH (1108 AD). However, these sources do not explain clearly the location of the center of the kingdom at that time. Sahjati origins can be traced from the story of the arrival of domestic Maghreb Djafar Noh in Tidore. Noh and then marry a local girl, named Siti Nursafa. From the marriage, was born four sons and four daughters. Four sons were: Sahjati, founder of the kingdom of Tidore; Darajati, founder of the empire Moti; Kaicil Open, founder of the empire Makian; Chapter Malamo Mansur, the founder of the sultanate of Ternate. While the four daughters are: Boki Saharnawi, which lowers the kings of Banggai; Boki Sadarnawi, which lowers the kings Tobungku; Boki Sagarnawi, which lowers the kings Loloda; and Boki Dewi Gita, which lowers Marsaoli and Mardike. Kingdom of Tidore is one of the pillars that form Kie Raha, the other is Ternate, Makian and Moti. Based on the legend of the origin of the above, it appears that the four kingdoms is derived from a common ancestor: Djafar Noh and Siti Nursafa. Regardless of right or wrong, the emergence and development of the legend of the origin is clearly demonstrated an awareness of brotherhood between the kingdom of Kie Raha (combined four major kingdoms in North Maluku, namely: Ternate, Tidore, and Moti Makian) so that they then legitimize it with a origin myth. From its inception until the king of the 4th, the central kingdom of Tidore not yet certain. 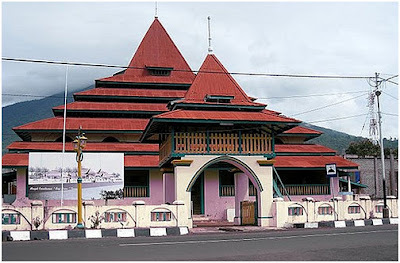 It was only in the era of Interest Mabunga Balibung Kolano Jou, information about the center of the kingdom of Tidore slightly ajar, and even then still under debate. The place is Balibunga, but the observer of the history of dissent in determining where the actual Balibunga this. There is a saying in the North of Tidore, and those that say it in the countryside south Tidore. In the year 1495 AD, Sultan Ciriliyati ascended the throne and became the first ruler of Tidore who took the title of sultan. At that time, the center of the kingdom was in Gam Tina. When Sultan Mansur ascended the throne in 1512 AD, he moved the center of the kingdom by establishing new settlements in North Tidore Rum. Position adjacent to the new capital of Ternate, and flanked by the Cape and islands Mafugogo Maitara. With state of the beautiful and tranquil sea, the location of the new capital rapidly developed and became a bustling port. In its history, occurred several times a relocation of the capital because of diverse reasons. 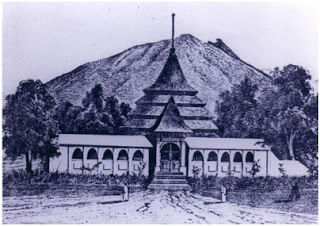 In the year 1600 AD, the capital was moved by the Sultan Mole Majimo (Alauddin Shah) to the south Tidore Toloa. The move is due to sharpening relations with Ternate, while the capital position is very close, so it is very prone to attack. Others added that, the displacement is driven by the desire to foster community preaching Kolano Tomabanga still animists to Islam. The last movement of capital is to Lemons Timore in the Sultan Saifudin (Jou City). Timore lime was later renamed Soasio until today. In the 16th century AD, the Portuguese and Spanish came to the Moluccas - including Tidore - to search for spices, momonopoli trade and colonize the country and then mastered the islands. In an effort to defend itself, there have been several times a battle between the royal-empire in the Maluku Islands against the colonial Portuguese and Spanish. Sometimes, Tidore, Ternate, Bacan and Jailolo allied to the European colonial experience and the difficulty to conquer other kingdoms of Tidore. After the death of the Portuguese, the Dutch came to Tidore with the same goal: monopoly and control of Tidore for the benefit of the Dutch themselves. In the history of the struggle in Tidore, the sultan, known most persistent and successful struggle against the Dutch was the Sultan Nuku (1738-1805 AD). For years, he fought to expel the Dutch from the Moluccas islands, including Ternate, Bacan and Jailolo. The struggle resulted in the surrender of the Netherlands in the Sultan Nuku on June 21, 1801 AD With it, Ternate, Tidore, Bacan and Jailolo back independence from foreign rule. England are also helping to drive the Dutch Tidore in then given the freedom to master Ambon and Banda, and entered into a treaty with Sultan Nuku, so that the relation between the two sides went pretty harmonious. At the time of this Sultan Nuku, Tidore reach the kingdom of glory and become a respected throughout the region, including by the European colonial. At the time of Sultan Nuku also, power to the Pacific island of Tidore. According to historical records Tidore, Nuku Sultan himself came and gave the name of the islands which he mastered, from Micronesia to Melanesia and the Solomon Islands. The names of the islands are still using the name to this day is Nuku Nuku hyphae, Nuku Oro, Nuku Maboro, Nuku Nau, Nuku Lae-lae, and Nuku Nuku Nono Fetau. Along with the entry of European colonial rule, Christianity was also entered Tidore. However, due to the influence of Islam that is so entrenched, then religion is not successfully develop its influence in Tidore. From the beginning of its establishment until today, 38 people have been ruling on the Sultan of Tidore. Currently, the ruling was the Sultan Hi. Djafar Shah. (Name and lineage of the other Sultans, from the beginning until the 37th is still in the process of data collection). Kingdom of Tidore established since 1108 AD and stands as an independent kingdom until the end of the 18th century AD after that, the kingdom of Tidore is in Dutch colonial rule. After Indonesia gained its independence, Tidore became part of the Unitary State of Republic of Indonesia (NKRI). In its heyday, the kingdom of Tidore include areas large enough to reach the Pacific Islands. Region around the island of Tidore which became part of its territory is Papua, group of islands of Raja Ampat and the island of Seram. In the Pacific Islands, Micronesia includes the power of Tidore, Marianas Islands, Marshall, Ngulu, Capita Gamrange Islands, Melanesia, Solomon Islands and some islands are still using the identity of Nuku, as Nuku Haifa, Nuku Oro, Nuku Nuku Maboro and Nau. Other areas included in the power of Tidore is Haiti and the Archipelago Nuku Lae-lae, Nuku Fetau, and Nuku Nuku Nono Wange. System of government in Tidore fairly well established and running well. The highest structure of power in the hands of the sultan. Interestingly, Tidore not know your system when the crown prince as the other kingdoms in the archipelago. Selection is done through the mechanism of selection sultan candidates proposed from the Dano-dano Folaraha (clan representatives from Folaraha), which consists of Yade Fola, Fola Ake Sahu, Fola Fola Rum and Good. From these names, then choose one of them to become sultan. When Tidore reached heyday in the era of Sultan Nuku, the system of government in Tidore had gone well. At that time, the sultan (kolano) assisted by a Council Wazir, in Tidore called Personality, custom nakudi se. The Council is led by the sultan and executing their duties handed over to Joujau (prime minister). Board members consist of Bobato pehak vizier secret (four parties bobato; semcam department) and representatives from the region of power. Bobato is tasked to manage and implement the decision of the Board of Wazir. Four bobato are: (1) pehak Labe, a kind of religious department in charge of Islamic issues. Labe pehak members consist of the kadhi, imam, preacher and modim, (2) pehak traditional areas of government and society that consists of Jojau, Capita Lau (warlords), Law Yade (external affairs minister), Law Soasio (affairs minister in) and Bobato Ngofa (minister of cabinet affairs), (3) Pehak Kompania (the field of defense and security) which consists of Kie Capita, and Capita Ngofa Major Jou, (4) pehak clerk led by a rank Tullamo (secretary of the kingdom). Underneath is Sadaha (head of household), Sowohi Kie (royal protocol field of spirituality), Sowohi China (a special protocol for Chinese affairs), Fomanyira Ngare (public relations empire) and Syahbandar (shipping paperwork). In addition to the above structure, there are other positions that help run the administration tasks, such as Gonone in charge of intelligence and Attack in charge of oil affairs propaganda. With regard to the lines of kinship, the matrilineal system of Tidore. However, it seems there is a change to the patrilineal line with the strengthening influence of Islam on Tidore. The most important patrilineal clan they call soa. In the customary system of Tidore, the ideal marriage is a marriage between first cousins ​​(kufu). After the marriage, each spouse is free to choose the new location of residence, whether the husband or wife's family environment. In anthropology is often referred to as utrolokal. In an effort to maintain harmony with nature, society Tidore organizing various kinds of ceremonies. Among the ceremony is a ritual Legu Gam Indigenous Affairs, the ceremony Lufu Kie Toloku daera se (circled area chanting accompanied by survivors), the ceremony Ngam Fugo, Dola Gumi, John Hale, and so on. To communicate in everyday life, people Tidore Tidore language belonging to the non-Austronesian family. With this language also, the Tidore then develop oral and written literature. Forms of Martial Arts is a popular oral dola bololo (sort of proverb or poem lightning), the argument drums (philosophical expression which accompanied the tool drum or drum), kabata (oral literature is performed by two teams in the even number, the argument in verse, couplets, thimbles, etc.). Some of Martial Arts is delivered orally and was shown to the accompaniment of drums instrument, a type of drum. Sasra writing is also quite well developed in Tidore, it can be seen from the Tidore sultanate heritage manuscripts that are still stored in the National Museun Jakarta. And perhaps, these manuscripts are still widely spread in the hands of individual communities. To meet the daily needs, Tidore many people who grow crops in the fields. Plants that are widely grown are rice, maize, sweet potatoes and cassava. In addition, also widely planted cloves, nutmeg and coconut. This is the spice that makes the famous Tidore, foreign traders visited China, India and Arabia, and eventually became seizure of white colonial. Ternate Island is a volcanic island covering 40 square kilometers, is located in North Maluku, Indonesia. Its people come from Halmahera who came to Ternate in a migration. At first, there are four villages in Ternate, each village is headed by a Head of Highways, in the language of Ternate called Momole. Gradually, four villages are then joined to form a kingdom they called Ternate. In addition to Ternate, there are also other kingdoms in the North Maluku region, namely: Tidore, Jailolo, Bacan, Obi and Loloda. Historically, Ternate is an area famous for spice, therefore, many foreign traders from India, Arab, Chinese and Malays who came to trade. As a representative of the community, which is associated with the merchants is the head of the clan (momole). How early establishment of the kingdom of Ternate story? The story, as the increasing trading activities, and the presence of external threats from the pirates or sea pirates, then later the desire to unite villages in Ternate, in order to position them more strongly. At the initiative of momole Guna, Tobona leader, then held meetings to form a stronger organization and to appoint a single leader as king. The result, momole Ciko, Sampalu leaders, elected and appointed as Kolano (king) first in the year AD 1257 with a degree Mashur Malamo Baab. Baab Mansur came to power until the year 1272 AD Kingdom of Ternate play an important role in the region, from the 13th century to 17 AD, especially in the trade sector. In the history of Indonesia, Sultanate of Ternate is one of the oldest Muslim kingdoms in the archipelago, also known as the Kingdom of Gapi. But, the name of Ternate is much more popular than Gapi. As mentioned above, in addition to Ternate, Moluccas there are also several other royal who also have an influence. Each kingdom compete to become the hegemonic power. During its development, Ternate apparently managed to become the hegemonic power in the region, thanks to the progress of trade and military power they have. Furthermore, Ternate started expanding its territory, giving rise to hatred other kingdoms. From hatred, finally goes to war. To stop the protracted conflict, then the King of Ternate to-7, namely Kolano Aiya Chile (1322-1331) invited kings Maluku others to make peace. After the meeting, they finally agreed to form a partnership known as Moti or Motir Persekutan Verbond. Other results of the meeting is, an agreement to form a uniform royal institution in the Moluccas. This meeting was followed by four kings strongest Moluccas, therefore, the alliance also called Communion Moloku Kie Raha (Four Mountain Moluccas). There are allegations, before Kolano Marhum, already King of Ternate, who embraced Islam, however, it is still a debate. Officially, the King of Ternate, which is known to convert to Islam is Kolano Marhum (1465-1486 AD), King of Ternate to-18. 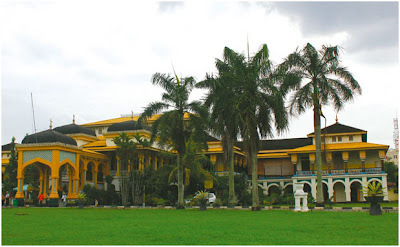 His son, Zainal Abidin (1486-1500) who later succeeded his father as king, had studied at the Islamic School of Sunan Giri in Gresik. At that time, he was known as Bualawa Sultan (Sultan Clove). When the Sultan Zainal Abidin then adopt Islamic law as the law of the kingdom. He also replaced the title Kolano with the sultan. To advance the education sector, he is also building schools (madrassas). Since then, Islam is growing rapidly in Ternate and became the official religion of the kingdom. The first Europeans who came to Ternate is Loedwijk de Bartomo (Ludovico Varthema) in the year 1506 AD Six years later, in 1512 AD, the group arrived in Ternate the Portuguese under the leadership of Francisco Serrao. When I first arrived, the whites are still not showing imperialismenya character. At that time, they still demonstrate good faith as a spice merchant. Therefore, the Sultan Bayanullah (1500-1521) who ruled in Ternate when it gave permission to the Portuguese to establish a trading post. Actually, the Portuguese came not only to trade, but also colonize and drain the wealth of Ternate to be brought into the country. However, malice is not known by the people of Ternate. When Sultan Bayanullah died, he left an empress named Nukila, and two sons are still young, Hidayat Prince and Prince of Abu Hayat. In addition, the younger brother of Sultan Bayanullah, Prince Taruwese also still alive and was ambitious to become the Sultan of Ternate. Portuguese immediately take advantage of the situation by pitting the two sides until civil war broke out. In the civil war, the Portuguese side with the Prince Taruwese, so Taruwese managed to win the war. Not unexpectedly, after winning the battle, Prince Taruwese actually betrayed and murdered by the Portuguese. Then, the Portuguese force to lift the Prince Imperial Council Tabarij as Sultan of Ternate. Since then, Prince Tabarij became the Sultan of Ternate. During its development, Tabarij also disliked behavior Portuguese in Ternate. Finally, he was slandered and exiled Portuguese to Goa, India. There, he was forced to sign an agreement to make Ternate as a Christian kingdom, however, he refused. Sultan Khairun who replaced Tabarij also flatly rejected this agreement. Portuguese actions against abusive people and families in Ternate sultan Sultan Khairun make so furious. He soon rekindle the spirit of resistance against the Portuguese. To strengthen the position of Ternate and help prevent the arrival of Portuguese Malacca, Ternate alliance then formed a triangle with Demak and Aceh, so the Portuguese difficulty sending military aid to Ternate. Portuguese almost suffered defeat. 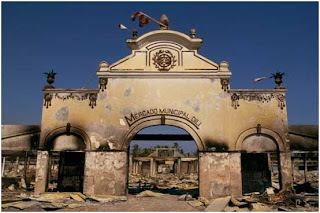 To stop war, then governor of the Portuguese in Ternate, Lopez de Mesquita Sultan Khairun invited to negotiate. Armed with a cunning and evil that they do indeed have, Portuguese and then kill the Sultan Khairun at the negotiating table. Babullah Sultan (1570-1583 AD) and then rose to the Sultan of Ternate replace the murdered Sultan Khairun Portuguese. He immediately mobilized forces to storm the Portuguese forces throughout the Moluccas and eastern Indonesia. After fighting for five years, finally succeeded in Ternate the Portuguese expelled forever from the earth to the Moluccas in 1575 AD In the history of Indonesian people's resistance, this is the first victory of the Indonesian people against white invaders. Here are some kolano and sultans who once ruled Ternate. The following data is not complete, because there are many names that have not been listed sultan. The order of the names of the sultan's order to be adapted to the sultan. Ternate reached heyday in the second half of the 16th century AD, in the reign of Sultan Baabullah (1570-1583), thanks to the height of the spice trade. At that time, to maintain the flow of trade in the region, Ternate has a formidable military force. The robustness of this fleet has been proven by the success they defeated the Portuguese colonizers. In the second half of the 17th century AD, the actual glory of the kingdom of Ternate has ended, along with the decline of Sultan Mandar Shah from the throne of the kingdom because the Governor was forced by the VOC in Ambon, Arnold de Vlaming. In fact, the Sultan was not only forced to step down, but was also forced to sign an agreement releasing all claims to its territory of Ternate in the Moluccas. Until now, the kingdom of Ternate has existed for more than 750 years. In the age already so old, Sultanate of Ternate still standing, though its existence is no more than a mere symbol. Position sultan now has no authority, but remains influential in the community. Sultan of Ternate today are Drs. Hi. Mudaffar Sjah, BcHk. (Mudaffar II) who was crowned in 1975, and was the 49th sultan. At the time of its inception, the power of the kingdom of Ternate only cover a few villages on the island of Ternate. Along with the development, the more advanced Ternate and reaches its apex in the 16th century. At that time, the power of the kingdom of Ternate covers an area of ​​Maluku, North Sulawesi, East and Central, East Nusa Tenggara, South Filipinos Islands (Mindanao) and the Marshall Islands in the Pacific. As described above, at its inception, the kingdom of Ternate is just a collection of several villages. At that time, the head kampungya called Momole. When the villages are united to form an empire, its leaders called Kolano (king). When Islam began to spread throughout the archipelago and the King of Ternate later converted to Islam, his Kolano replaced by the sultan. Kolano first took the title of Sultan Zainal Abidin is. Since then, the supreme leader is the sultan of Ternate. Furthermore, because the royal use of Islamic law, then, scholars also plays an important role. To assist the Sultan perform royal duties, and also established the position Jogugu (prime minister) and the Advisory King called the Fala Raha (four houses). Fala Raha is a representation of the four noble clans who became the backbone of the Sultanate of Ternate. It could be said that, Fala Raha actually four momole replacement in the period before the arrival of Islam. Each led by a Kimalaha secret. Among Kimalaha are: Marasaoli, Tomagola Tomaito and Tamadi. The high court officials from four of these clans. If the sultan did not leave heirs, then his successor is selected from one of these four clans. Other positions are established to assist the task of the sovereign is Bobato Nyagimoi (Council 18), Sabua Raha, Capita Lau, Salahakan and Sangaji. Ternate is an area known for spice. The farming population are those who live in the hill area, they planted cloves, nutmeg, cinnamon and walnuts. Cloves from Ternate is famous for good quality. In areas rather low, people plant oil. People who live near the coast are also many who became a fisherman. In addition to farmers and fishermen, the people of Ternate also many became merchants. Ternate is the main meal of rice, sago or manioc (cassava), which is specially processed, known by the name huda, shaped like the slices of bread. Of cassava, people also make papeda Ternate. Rice is consumed by people originating from the island of Halmahera Ternate, Makassar and Manado. On reflection, the actual relics of Ternate is not comparable with the greatness of his name. There is no intellectual heritage, architecture or high-quality art he left behind. Only the only literary legacy left by a theorem is Dolo bololo moro. This literary form of poetry, proverbs, like, which mostly contains the traditional moral education. In fact, as a primary dealer of spices in the Moluccas, Ternate was associated with a more advanced civilization such as Javanese, Malay, Chinese, Arabs and Europeans. However, it did not seem to leave pengaruh.Berkaitan by the absence of written culture, probably due to Ternate is always busy with the affairs of war and conflict. Before Europeans came, Ternate conflict with surrounding kingdoms because of fighting over hegemony. After the Europeans came, the conflict occurs with the Europeans. The implication, of Ternate to devote all his energy just to sustain themselves, because, the context is: attacking or being attacked. Due to these reasons, the emerging art culture in Ternate, such as dance cakalele, has a military character. When you look at the history of Mindanao, the civilization was dated between 4,500 and 2,000 BC see Subanen Tribe of Mindanao in the southern Philippines. MINDANAO WAS NEVER PART OF SULTANTE OF TERNATE AND THE SULTANATE OF TIDORE BUT TIDORE JUST EXTENDING INFLUENCE AND ALLIANCE WITH THE MAGUINDANAO SULTANATE BECAUSE MINDANAO WAS ALREADY DIVIDED INTO DIFFERENT SULTANATE AND KINGDOMS.. When you look at the history of Mindanao, the civilization was dated between 4,500 and 2,000 BC see Subanen Tribe of Mindanao in the southern Philippines appears to be earlier than Indonesia. The Asia pacific history and artifacts found out that the first human existence was from the North Luzon and the oldest, the earlies human that exist in the Whole Asia pacific see the timeline of the Philippines. Meaning the people of the asia paficic including indonesia are from the ancient of the Ybatan tribe in northern Luzon which was called as Austronesian. The blood line of all facific lander are from the North Luzon of the North Philippines close to Taiwan. As discovery that corrected the previous thought that the Austronesians are from taiwan but later found out that the Old Austronesians are from Cagayan, North Luzon with a modern name Ybatan Tribe (Origin of Austronesian) traveling to Taiwan and migrating all over the Asia pacific.